We love getting feedback on the products we sell. We thought we’d post this review of the Fathead Wall Graphics from one of our employees ( we use many of the products we sell!). 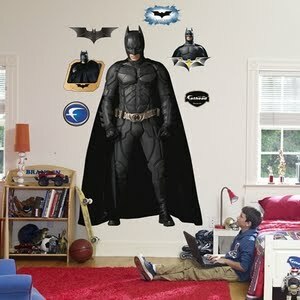 We love the Dark Knight Fathead, it looks really cool in my brother’s room. It’s definitely worth the investment and everything they say about it is true in terms of the quality and the ease with which you can remove it without harming the walls, etc. They recommend having two people to hang up the large ones. Do not take ignore that recommendation! I may have needed three people. I think my biggest mistake was completely removing the Fathead from the backing and thinking that I could then just put it on the wall (which was actually in the next room). It completely stuck together, and it is a lot easier to get it off a wall than it is to pull it apart when it is stuck to itself. While struggling to straighten it back out again, it got creases in it and a small tear. At one point, I thought we would just have to ball it up and order a new one. But we stuck with it and eventually got it all straight, and now it looks great on the wall. I will order another one for my daughter’s room, and next time, I will gradually remove it from the backing as I am sticking it onto the wall. Duh! A little about Fatheads. Fathead wall graphics are life-size action images that you stick on any smooth surface. You can move them and reuse them and they are safe for walls. Fathead wall graphics are way better than a poster, much bigger than a sticker and tougher than a decal. Need decorating ideas? Need to find a unique gift? Need ideas for party decorating? Need to decorate a den, office, kid’s room? Fathead has you covered! Great for party planners, wedding planners, interior designers, decorators, and fans of all ages! A fathead can transform an entire room in a fraction of the time, and cost of painting or wallpapering.